Photo submitted to the Daily Mining Gazette Pictured (left to right): Back row: Maddie Peterlin, Lindsey Whiting, Molly Larson, Rachel Hall and Jocelyn Perala. Front row: Coach Lea Bjorn, Cami Johnson, Kenli Anderson, Kristi Keranen, and Coach Heather L’Esperance. ASHWAUBENON, Wis. — Over the past weekend, The U.P. Power club volleyball team traveled to the greater Green Bay area for the Bay Bash Invitational in Ashwaubenon. Going 8-2 on the day Saturday, the girls defeated three teams from Wisconsin and the Summit U18 team from the central U.P. en route to the Silver Bracket title. U.P. 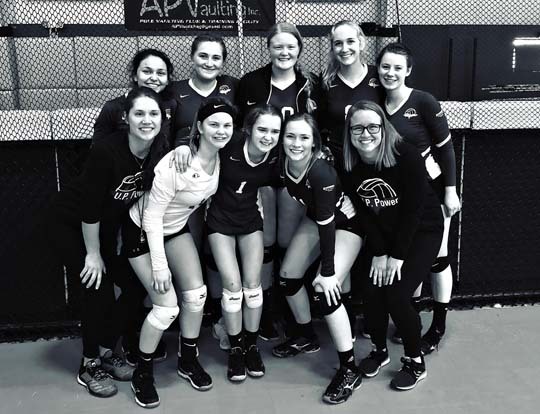 Power, who is coached by Heather L’Esperance and former Calumet Copper Kings standout Lea Bjorn, is a club team made up of girls from Calumet, Lake Linden-Hubbell and Houghton who are currently sophomores and juniors. The club gives girls who want to keep honing their skills against competition through the Spring a chance to do just that, playing in six tournaments over the course of five months and getting a couple of practices, at least, per week. 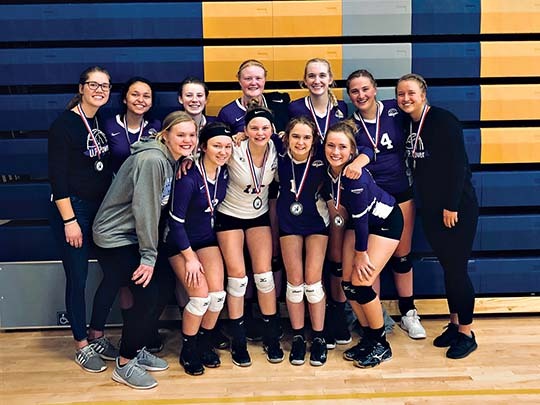 “This team gives the girls the opportunity to continue playing volleyball after the high school season,” said L’Esperance. Last season, U.P. Power was coached by Aubrey Havlichek, who was also coaching at Finlandia University. Several of the girls who were planning to play club again this season actually approached L’Esperance about coaching. “They reached out to Lea and I,” L’Esperance said. “We were more than happy to help out. As fans of the Michigan Tech volleyball program have noticed in recent years, club volleyball is where head coach Matt Jennings likes to find his players. L’Esperance knows that her girls have aspirations to play beyond high school need this type of opportunity. L’Esperance feels that the group actually has great chemistry despite having girls who have had to fight hard against each other during the varsity high school season. Part of having a high skill group is that the girls may not necessarily get the chance to play their natural position throughout the day. “Everyone just has to do their job,” L’Esperance said. “The harder you work, the harder your teammates will work. In the Bay Bash, L’Esperance and Bjorn noticed that the players were improving by leaps and bounds. U.P. Power will take a couple of weeks off for spring break before coming back together in time for a tournament in Duluth, Minnesota, in April.